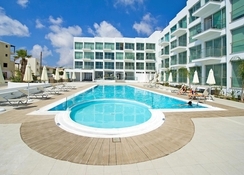 Coralli Spa occupies a stunning coastal location at the quieter end of Cyprus, in Protaras. Coralli Spa can be reached from the nearest airport Larnaca International Airport in approximately an hour. Once here you’ll be treated to beautiful views over the Mediterranean Sea. Sunrise beach is a short walk away and is considered amongst the finest with fine golden sands stretching out into the sea whilst also recommended is a day trip to the Cape Greco National Forest, easily reachable with a short journey by taxi. Coralli Spa itself is fully furnished with facilities including swimming pool, tennis court, sun terrace and spa. 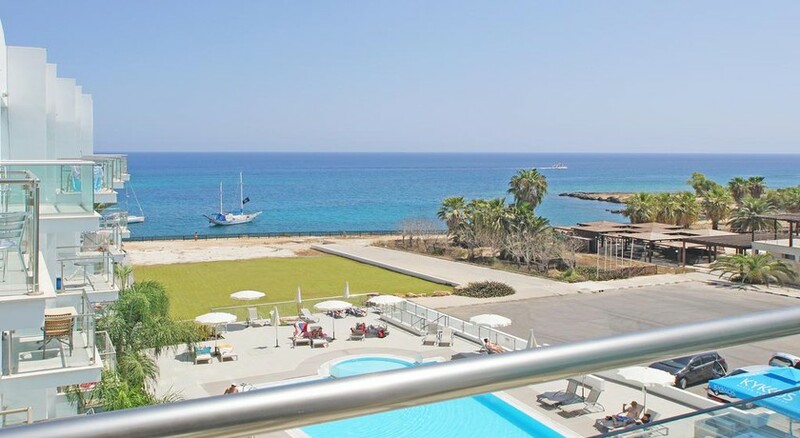 You can choose from rooms which include a sea view and all rooms are comfortably spacious and designed with light colours as well as admitting in lots of light through their large windows in order to maximise the beautiful Cypriot sun. Coralli Spa can be found on the eastern coast of Cyprus and boasts a stunning view out over the Mediterranean Sea. You can walk to the nearest beach in under 5 minutes as it is located just 200 meters from the hotel. The nearest airport is Larnaca International Airport, 70km away. It is a relatively quiet location but with all you want within a quick walking distance. You’ll have your pick of restaurants serving both international and local dishes ranging from Italian to Indian as well as seafood and great drinks simply by wandering along Protaras road, the main hub of activity under a mile away. 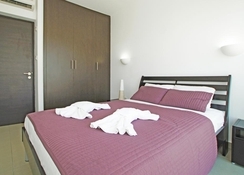 Like many Cypriot hotels and resorts, accommodation at Coralli Spa will be found as either studio or one-bedroom and two-bedroom apartment options. These also include a kitchen and typically feature an oven, stove top, dishwasher, fridge/freezer, washing and more. Apartments will be larger with open plan living areas and sleep three adults and one child or two adults and two children whilst studios can sleep two guests whilst a maximum of five can stay in a two-bedroom apartment. You’ll be able to spend a comfortable stay in your room kitted out as it is with the all the necessities such as air-conditioning, free wi-fi, en-suite bathroom and private balcony along just some of the features. All rooms at Coralli Spa are self-catering but the fully equipped kitchen and nearby shops will ensure you can make the most of it. However, you’ll want to take advantage of the ample food and drink choices in Protaras. Within a five-minute walk, you’ll hit the main drag of Protaras street where a host of exceptional dining experience which combines amazing views over the Mediterranean Sea can be experienced. If you’re in the mood for some Italian comfort food then head to Promises Restaurant, further along, is the recommended Happy Days Authentic Mediterranean restaurant serving traditional Cypriot and Greek food. You’ll also have the pick of several tavernas and bars. Coralli Spa is a great place to stay whether you’re looking to stay active or just have some downtime. Those who want to just kick back and relax can do so by the outdoor swimming pool, sunbathing terrace or check out the spa with its jacuzzi, sauna and massage rooms as just some of the ways to relax. The stunning Sunrise Beach is often said to be amongst the best on Cyprus with its golden fine sands. A day trip to the Cape Greco National Forest Park located just a couple of miles south-east of Coralli Spa is also highly recommended, where you can hit the trails and hike or cycle through the forest or check as it looks out over beautiful cliffs stretching down into the Mediterranean Sea.